Continue Reading "QIPPOW Quotes Idiom Proverb Phrasal Verb of the Week 15-03-15"
I worked. I worked, didn't I? You worked. You worked, didn't you? He worked. He worked, didn't he? She worked. She worked, didn't she? It worked. It worked, didn't it? We worked. We worked, didn't we? They worked. They worked, didn't they? 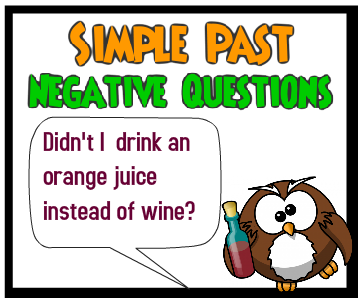 Paying attention to the correct forms of the negative questions, add the tag question at the end of each sentence. You walked quickly, didn't you? 1.You watched the game, didn't you? 2. I climbed the ladder, didn't I? 3. We pleased the visitors, didn't we? 4. They canned the peaches, didn't they? 5. He received the letter, didn't he? 6. You saw the fireworks, didn't you? 7. It cost five dollars, didn't it? 8. She hit the ball, didn't she? 9. He did his homework, didn't he? 10. They cut the ribbon, didn't they? 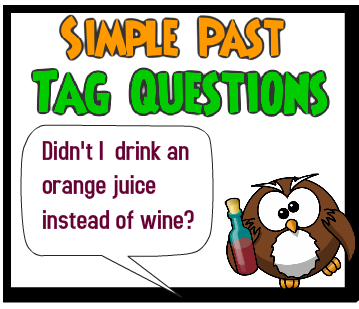 Continue Reading "Simple Past: Tag Questions - Exercise"
Continue Reading "Simple Past: Negative Questions Exercise"
example, the irregular verb to speak is used. 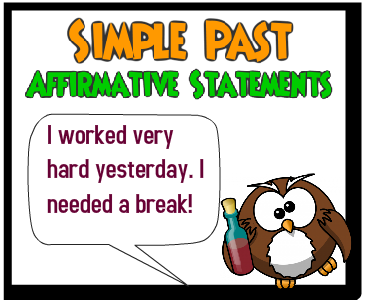 The verb to speak has the bare infinitive speak and the Simple Past spoke. 1. We did not enjoy ourselves. 2. She did not pin on the brooch. 3. I did not fan myself. 4. They did not empty their pockets. 5. You did not reply at once. 6. He did not go to work. 7. We did not swim across the river. 8. They did not take the bus. 9. I did not shut the windows. 10. You did not run fast. 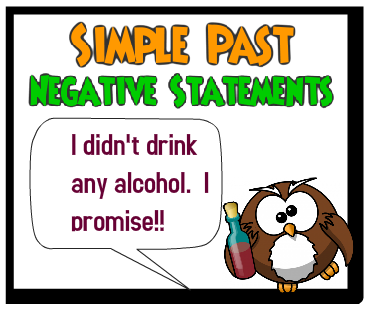 Continue Reading "Simple Past: Negative Statements Exercise"
1. Did she hurry to school? 2. Did they carry the parcels? 3. Did you close the door? 4. Did I plug in the lamp? 5. Did they plan the party? 6. Did we teach the class? 7. Did she tell a story? 8. Did they strike a bargain? 9. Did he meet his friends? 10. Did I shake hands? 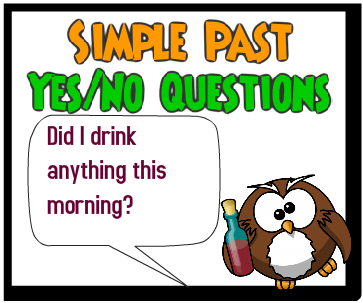 Continue Reading "Simple Past: Questions Exercise"
Continue Reading "Simple Past: Affirmative Statements Exercise"
In the case of irregular English verbs, the form of the Simple Past must be memorized. As illustrated by the examples below, for some irregular verbs, the Simple Past is the same as the past participle; whereas for others, the Simple Past differs from the past participle. A table of 140 common English irregular verbs is provided. 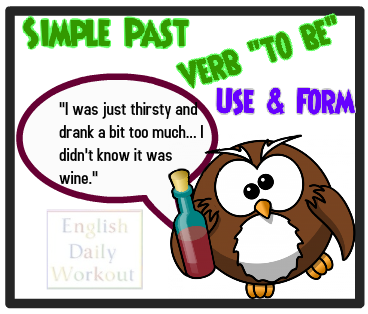 Continue Reading "The Simple Past: Affirmative Statements with Irregular Verbs"
Continue Reading "Simple Past: Questions and Negative Statements with the Verb "to be""
English Grammar Lesson and Exercise on: Simple Past of Verb "TO BE"
Continue Reading "Simple Past of the Verb "TO BE": Form & Uses"